There was no Twitter back then, of course. Nor were there cell phones, websites, or a 500-channel cable universe. That’s one reason that the remarkable victory by a bunch of American college hockey players over the feared Soviet Red Army squad – aka “Miracle On Ice” – was able to sneak up on a country desperate for good news and become both an overnight and lasting sensation. It’s also why the gun-on-the-ice story has been largely unknown until now. That un-called misconduct penalty is just one of the nuggets unearthed in National Geographic Channel’s upcoming three-night event The ‘80s: The Decade That Made Us. “The ‘80s” makes a convincing case that the Miracle On Ice helped snap America out of the gloomy ‘70s and launch it headlong into the go-go, glitzy ‘80s. Schneider discovered the gun when he checked a Soviet player into the boards during a pre-Olympics exhibition game and the opponent’s jersey slid up, revealing the firearm. Though the weapon wasn’t actually intended to intimidate the American team. As U.S. goalie Jim Craig tells it, the packing “player” was a KGB agent who was traveling with the Soviet squad to keep its players from defecting to the West. 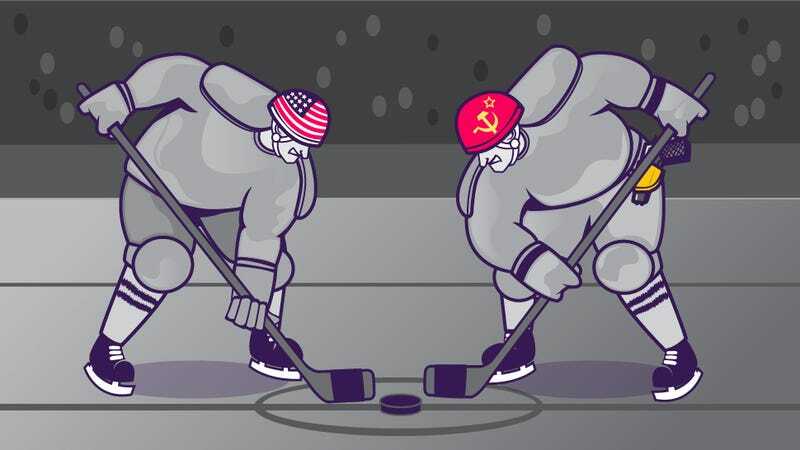 In fact, the only reason the KGB agent was on the ice at all was because the Soviets had no fear of the callow Americans, who averaged five years younger and 13 pounds lighter than the Red Army veterans they faced in Lake Placid. Thus the Soviets had so little respect for the American team that they let the KGB agent take a few shifts. It’d be like a pro basketball team letting one of their security guards log a few minutes against their opponent – and still winning by 20. The Soviets had every reason to feel confident. They had swept the past four Olympics, routed an NHL All-Star team 6-0 to win the 1979 Challenge Cup and wiped the ice with the U.S. team 10-3 at Madison Square Garden in a final pre-Olympics tune-up. Though this was still the era of Olympic “amateurism,” the Soviet players were all on the Red Army payroll and essentially comprised the nation’s top pro athletes. That didn’t do the Soviets much good on Feb. 22, 1980. Mark Johnson’s unlikely goal that beat the first-period buzzer to make it 2-2 set the stage for Mike Eruzione’s famous third-period game-winner in the 4-3 victory. Today it’s hard to decide what’s more unlikely: that a group of college kids could beat the world’s best professional team, or that the legendary game was broadcast not live but on tape-delay. Tune in to the National Geographic Channel this Sunday, April 14 at 8 PM to see the story behind the "Miracle On Ice" and other ‘80s wonders that affect us today in the first of six episodes of their new three-night event The ‘80s: The Decade That Made Us.